Become a lifetime member of SEMSoc for £5. Dr. John Morgan: Drugs in Sport. Dr. Morgan is the team doctor for The Widnes Vikings rugby league club who play in the First Utilities Super League. In addition to this he runs ‘Bucket and Sponge Medical’ a company supplying doctors to a wide variety of sports teams throughout the North West. He also runs several regular SEM clinics and is a GP at a large practice just outside Bolton. He will be giving a talk on the use of drugs in sport including drug testing, performance enhancing drugs and the challenges facing a sports physician when treating patients. Please check facebook and twitter nearer the time for more details. The Sports and Exercise Medicine Society are pleased to welcome you to our first lecture of 2013/14 academic year; an Introduction to Sports and Exercise Medicine by Dr Alan Sweeney. 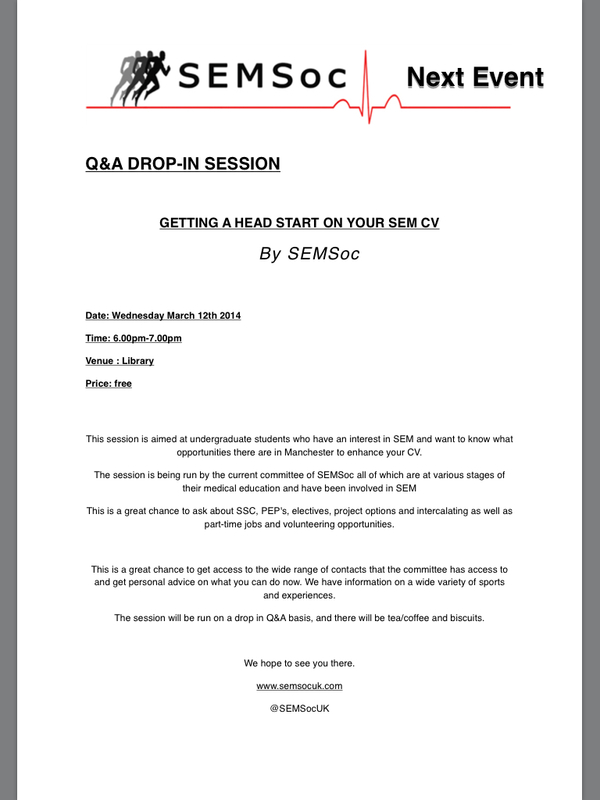 Ever wondered just what SEM involves? Or wanted to hear more about specialist training in SEM from someone who is enthusiastic and passionate about the speciality? Then come along to the lecture. Where: Manchester Royal Infirmary, Education North. Dr Alan Sweeney has recently completed core medical training and will be applying for a Specialist Training post in Sport and Exercise Medicine at the start of next year. Around his current role as an anatomy demonstrator, he provides medical cover to Wigan Warriors academy and England’s Under 18 Rugby League team. His personal interests include obesity management, exercise prescription and improving medical care at mixed martial arts competitions. SEMSoc are pleased to invite you to our next lecture, “A Career in Surgery” by Senior Orthopaedic Registrar, Mr Neil Jain. Currently a Senior Orthopaedic Trainee in the North West, based around Manchester. Throughout his time he has furthered his interest in Orthopaedic Surgery and Sports Medicine, working with Wolverhampton Wanderers FC and Barrow Raiders RLFC. He also has a keen interest in Research, presenting multiple times at National and International meetings and publishing in peer reviewed journals. He has spoken at the recent World Sports Trauma Congress in London in 2012, and will be speaking at the International Society of Arthroscopy, Knee Surgery and Orthopaedic Sports Medicine in Toronto, Canada in May. This research interest has included current affiliations with the English Football Association and the English Institute for Sport. Organising an Olympics: Just what does it take? The Sports and Exercise Medicine Society are pleased to announce their next lecture, by Pam Venning. Pam was the head of Medical Services at London 2012 and will be talking about her experience during the 5 years in the run up to the games and of course during the games itself. It will be an unique opportunity for anyone interesting in what it takes to organising medical cover for events. Pam had also worked as a Senior Project Manager at University of Manchester and Village Medical Centre Manager at the Manchester Commonwealth Games 2002.